Just outside Nigeria’s modern and prosperous capital, Abuja, are the villages of Gwako, Gwagwalada, Kashanfa and Gosaone, where the lifestyle is much the same as it has been for centuries, one of many such population groups yet-to-be-affected by the prosperity of this oil-rich nation. While many of these folks have found work in Abuja, they can’t afford to live there. Others in these villages are poor farmers, or unemployed settlers from different part of Nigeria. Most are doing well to eke out an existence, and the chances of them being able to send their children to a school are slim. FCF Project Partner EduVision built and maintains a primary school for the children of this targeted community. 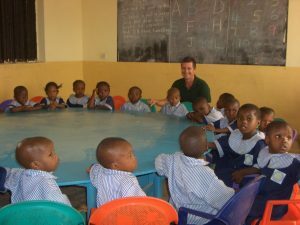 The school also serves as a base to provide adult literacy classes, primarily for the village women, as well as training local teachers and providing them with employment. 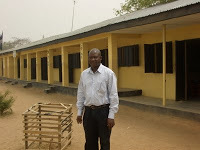 EduVision also established a secondary school in an adjoining village, which likewise provides a free education for those who have completed primary school. We also traveled to a large population center on the opposite side of Abuja, where I checked on the progress of an Internet Training Center (still under construction), designed to help local youth an opportunity out of poverty.